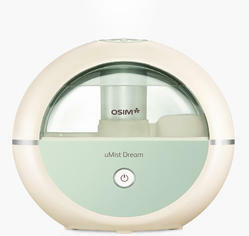 Our range of products include umist dream humidifier. Featuring Ultrasonic technology, the OSIM uMist Dream humidifier creates the ideal humidity level in the air to provide a hydrated, comfortable and healthier indoor environment for a good night's sleep. The uAlpine’s Multi-action Tru-air purification process, featuring the Ioncluster technology, purifies your surroundings and provides clean, fresh air for easier breathing to enhance your family’s respiratory well-being. Using ultrasonic sound wave energy to break up water into extremely fine mist, the uMist Dream quickly adds moisture to the air to protect your skin, eyes, throat and nasal passages in dry, air-conditioned or heated rooms. Enjoy up to 8 hrs of protection as you sleep through the night and wake-up feeling more refreshed and alert. Look forward to greater comfort, improved sleep and healthier living as you preserve your body’s hydration level for better well-being. With a rotatable nozzle, you can direct the mist flow towards the direction where you need it most. For added convenience, a night light feature gives you easy access to better air quality at all times while a LED indicator prompts you for a refill when water level.